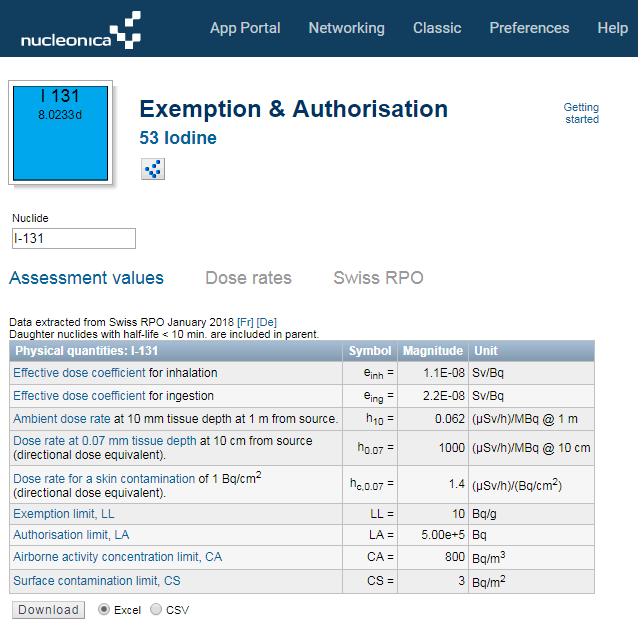 Based on the recently released Swiss RPO data (January 2018), this new Nucleonica application provides data on exemption and authorisation limits for radioactive materials. Based on assessment values for dose coefficients for ingestion and inhalation, together with specific dose rates at various tissue depths for external radiation (h10, h0.07, and hc,0.07), values are given for the operational radiation protection quantities together with exemption and authorisation limits and guidance values. – Based on the dose coefficients for ingestion and inhalation, together with specific dose rates at various tissue depths for external radiation (h10, h0.07, and hc,0.07), exemption limits LE, authorisation limits LL, and guidance values for airborne CS and surface contamination CS are given. – From the above quantities, and the user specified activity (Bq) and surface contamination (Bq/cm2), the total doses for ingestion, inhalation and external radiation (H10, H0.07, and Hc,0.07) are calculated. – The latter quantity, Hc,0.07 allows the user to calculate the dose rate to skin following a spill of radioactive material. 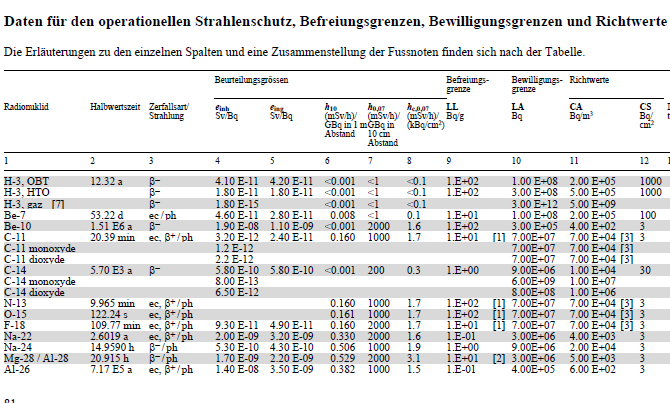 – a table of the Swiss Operational radiation protection data is provided together with links to the corresponding web pages in French and Germany are given. The Swiss Radiological Protection Ordinance (RPO) with status as of 1 January 2018 is now available. As part of its verification procedure, the Nucleonica team provides an annual check on the various quantities listed in this report and used in Nucleonica applications. A new online shop for the purchase of printed versions of the Karlsruhe Nuclide Chart is available at http://nuklide.shop. A nuclide chart is a two dimensional representation of the nuclear and radioactive properties of all known atoms. A nuclide is the generic name for atoms characterized by the constituent protons and neutrons. In contrast to the periodic table which is based on chemical behaviour, the nuclide chart arranges nuclides according to the number of protons and neutrons in the nucleus. Each nuclide in the chart is represented by a box containing the element symbol and mass number, natural abundance, half-life, decay types and decay energies. The nuclides boxes are coloured according to their decay properties. Nuclear isomers, or excited states, can be represented by sub-dividing the box accordingly. 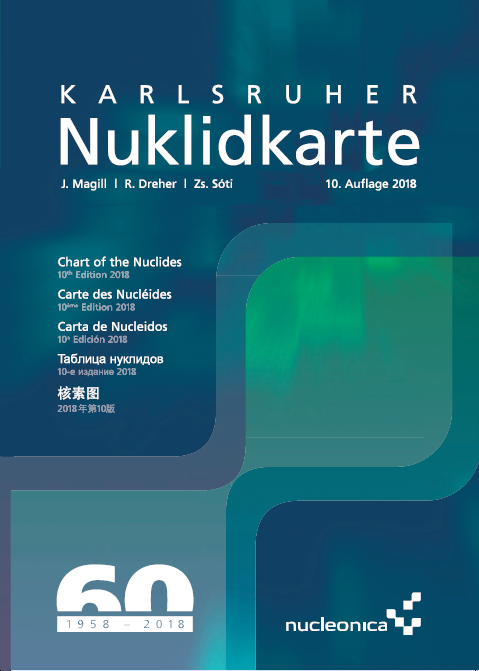 The 10th edition of the “Karlsruher Nuklidkarte” contains new and updated radioactive decay data on 696 nuclides (47 new nuclides) not found in the previous (2015) edition. In total, nuclear data on 4040 experimentally observed ground states and isomers are presented. The new names and chemical symbols of elements 113, 115, 117, and 118 have been updated. In 2016, IUPAC agreed on the names nihonium (113, symbol Nh), moscovium (115, Mc), tennessine (117, Ts), and oganesson (118, Og). Until now, these elements have been referred to simply by the number of protons in each atom – 113, 115, 117 and 118, respectively. Most recent values of the atomic weights, isotopic abundances and cross sections are included together with the thermal fission yields for both U-235 and Pu-239. For twelve elements, a range of atomic weights is given to reflect the isotopic variability in natural materials. The accompanying booklet again contains the multi-lingual “Explanation of the Chart of the Nuclides” in English, German, French, Spanish, Russian, and Chinese, updated to reflect changes in the Chart. The Reduced Decay Schemes section, initiated in previous editions, has been considerably expanded to include a total of 88 examples. This new 10th Edition of the Karlsruhe Nuclide Chart is the result of a collaboration between Zsolt Sóti from the EC’s Joint Research Centre and Joseph Magill and Raymond Dreher from the Nucleonica team. 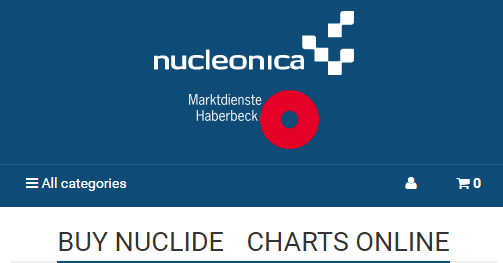 An online version of the Karlsruhe Nuclide Chart Online is available through the Nucleonica nuclear science portal (www.nucleonica.com). This new 10th Edition coincides with the 60th anniversary of the Karlsruhe Nuclide Chart. The new web page header in Nucleonica is based on the principles of Responsive Web Design (RWD) and Flat Design and is optimised for easy navigation on a variety of devices and window or screen size (e.g. tablets and smartphones). Web page headers are like miniature versions of the home page located at the top of the internal web pages. Similar to the landing page, the function of the header is to provide site identity and easy navigation through the web pages.